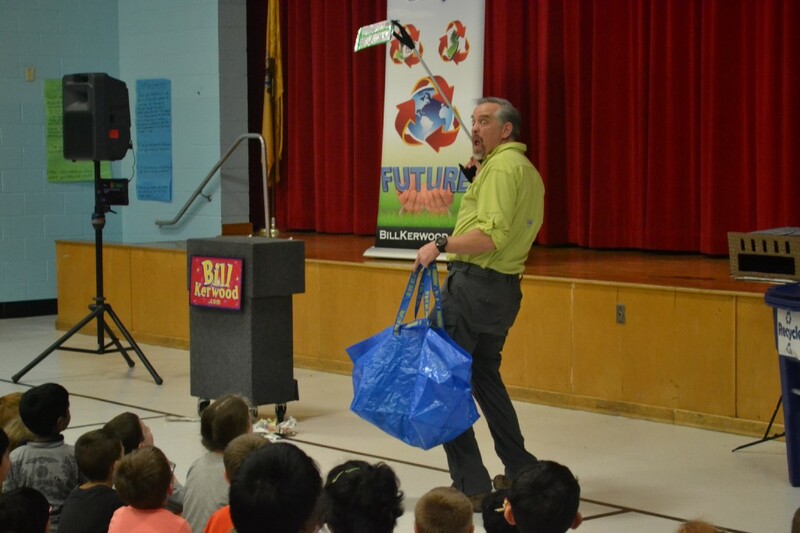 Entertainer Bill Kerwood visited Parkway Elementary for an environmental assembly sponsored by the New Jersey Clean Communities Program. 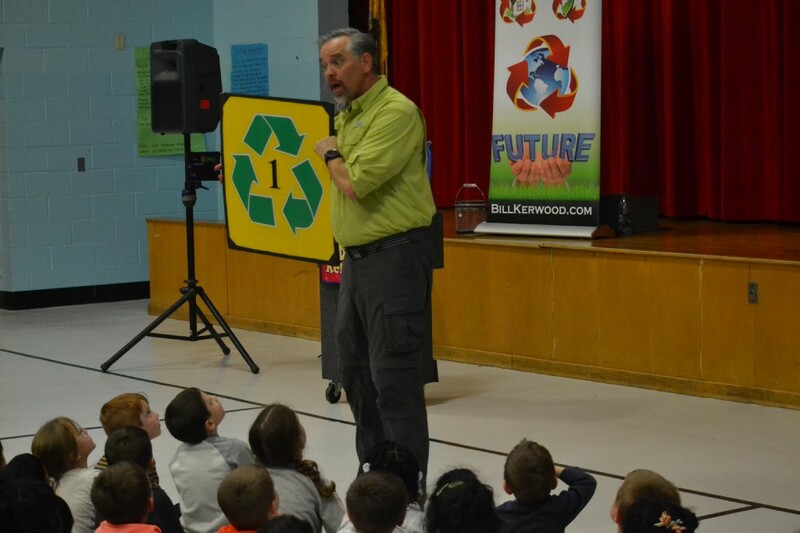 Students at Parkway Elementary School learn about the Resin Identification Coding system and how to properly recycle from entertainer Bill Kerwood during an assembly sponsored by the New Jersey Clean Communities Program. The students at Mt. Laurel’s Parkway Elementary School happily shouted out the phrase many times one afternoon last week during their “Magic of Clean Communities” assembly. The assembly, sponsored through the New Jersey Clean Communities Program, focused on teaching kids about their environmental responsibility to contain litter and recycle when possible. Leading the kids through their lessons, while entertaining them at the same time, was entertainer Bill Kerwood. Throughout the show Kerwood used jokes, voices, props and even a puppet to get kids in the mindset of reducing, reusing and recycling. “I operate under ‘you must entertain them before you can be heard,’ so it’s highly interactive with a lot of call and response,” Kerwood said. 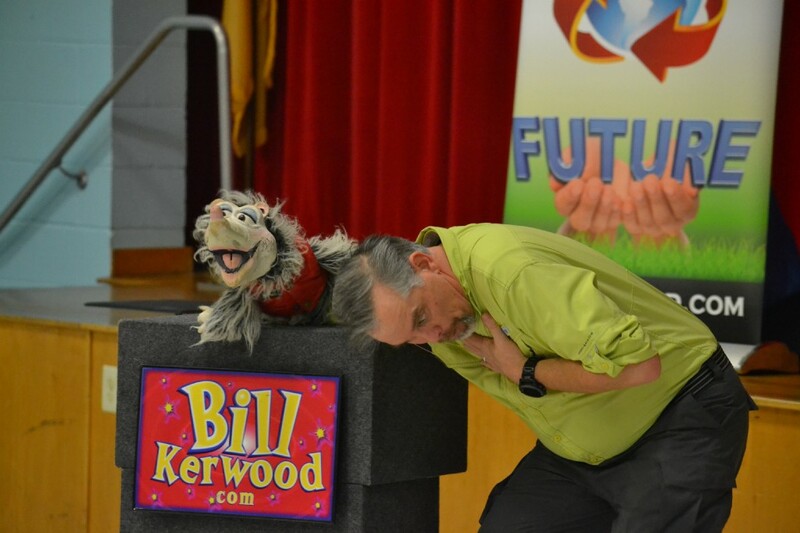 Entertainer Bill Kerwood and his possum puppet teach students about keeping the environment clean during an assembly sponsored by the New Jersey Clean Communities Program at Parkway Elementary School. During the assembly, kids learned practical tips for recycling, such as the Resin Identification Coding system that signifies how plastics No. 1 and No. 2 can be recycled throughout New Jersey, in addition to plastic No. 5 that can be recycled because the students live in Burlington County. “They go home knowing exactly what can and cannot be recycled curbside,” Kerwood said. Kids also learned about how plastics, aluminum and natural debris such as leaves can clog storm drains, eventually leading to the pollution of the water they drink. And for a broader lesson, Kerwood attempted to open the students’ minds to the concept of keeping the environmental clean for future generations. To that point, Kerwood began the show hobbling as a 90-year-old man while picking up litter he found on the ground before transitioning into his normal, middle-aged self for the show. Kerwood said that opening skit primes the young audience for multigenerational thinking, which he believes is missing from children today. Then, midpoint through the show, Kerwood puts the onus on the students to learn that it’s their responsibility to care for the environment for their grandchildren as their grandparents did for them. “You’ll see a few confused faces when I say ‘your kids and grandkids,’ because a lot of these kids have never even thought in those terms” Kerwood said. Kerwood said he visits about 36 schools throughout the spring, and since kids all live in the same digital world in today’s age, he presents the same highly animated performance to capture their eyes and ears before imprinting lessons on their minds.